As you may know, we're refreshing the user interface of SpiraTeam and KronoDesk in their next releases to be more modern, lightweight and easier to use. They are web applications and there are many tools at our disposal that weren't available in 2011 when their current UIs were developed - Bootstrap, KnockoutJS, jQuery to name just a few! 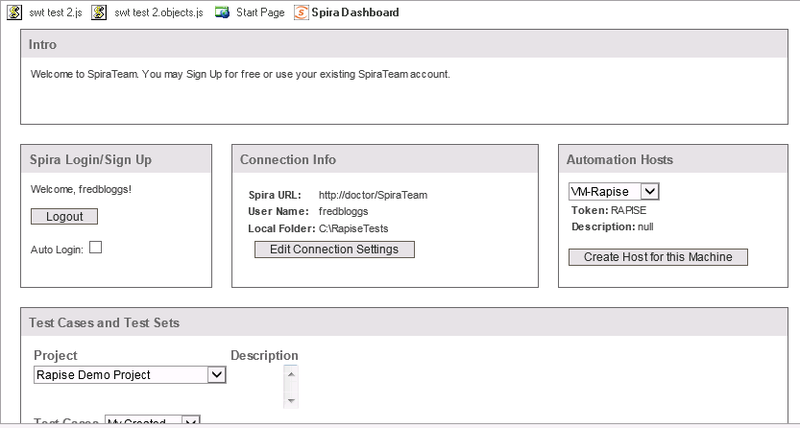 However when we started looking at the two embedded web pages in Rapise - the Start Page (designed to help new users get oriented) and the ﻿Spira Dashboard﻿ (designed to help you manage your test cases in Spira from the convenience of Rapise) we realized that they were also not as well designed as they could be and that it made sense to apply the ideas from SpiraTeam. In this case we were constrained to keeping the functionality as-is and to continue to use the older YUI web framework that was already in place. The current Start Page was designed to mimic the colors and layout of the underlying Windows application, however we found that the overall impression was of a bunch of grey boxes with the headings that were hard to read and text that was too small to understand. Most users skipped over this page and starting using the ribbon at the top. This completely destroyed the purpose of this page, which was to ﻿make it easier for new users to get started!! With the new Start Page, the same elements are in place, but we moved the guide for new users right to the top, rather than having it buried under the current test information. Once they choose to hide this guide, the order then reverts. We also removed many of the borders on the page and avoided having grey on grey headings to make everything more legible. In addition, many of the same issues with the Start Page were also present, weak use of contrast and color meant that it was hard to see the information and the large numbers of similar looking buttons made it difficult for a user to see what were their primary actions. As you can see, by making fairly modest changes, you can dramatically improve the usability of an existing application without having to completely re-engineer it.